Looming to the east of our great state is the singular mountain range, the Sierra Nevada. While many of us think of the Sierra as a great place to get away for the weekend, few realize what an inspiration the Sierra has been to others. Anyone who has driven along highway 49 south of Jackson has seen the lasting impact of Mark Twain, who wrote works set in the Sierra, from the city of Twain Harte, to the city of Angels Camp, whose streets are covered with paintings of jumping frogs and statues of the same. Anyone who has traveled to Yosemite probably knows that John Muir took much of his inspiration from the region and he fought hard to see it protected and still most may not realize that he was not totally successful in his efforts to preserve the park. Today, Hetch Hetchy Reservoir stands as the only reservoir located within a National Park. Muir’s writings and fights for the environment stand as one of the inspirations of the environmental movement. We Californian’s feel such pride in our connection to the legacy of Muir that we chose his image along side of that of the Yosemite Valley to grace the back of the California State Quarter. 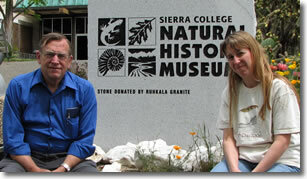 For this edition of the Journal of the Sierra College Natural History Museum we have chosen to focus on the Sierra Nevada and the conservation movement that it has inspired. We start off with two very special looks at John Muir himself. This edition contains a biography of Muir’s life, a life that is very often wrapped in legend. Carl Zichella, the Regional Staff Director for the Sierra Club in California, Nevada and Hawaii writes how Muir’s legacy and the Sierra itself inspired him to environmental action. You can also find a sample of Muir’s writings and quotes within this edition read by Sierra College’s own Dan DeFoe who is the editor of Snowy Range Reflections, which is also produced by Sierra College Press. John Muir’s legacy lives on through many individuals and activities, but Lee Stetson truly brings Muir to life. For 26 years Stetson has been performing as John Muir in Yosemite Valley. Stetson brings Muir to life in ways that makes Muir relevant to current generations. Stetson holds a special place in Sierra College history as he has been performing during our Earth Week celebrations on campus for 18 years to near sold out houses. Included in this edition we have a special profile honoring Mr. Stetson in the hopes that others will learn of his great talent and come and share in his work. Sierra College has, thanks in large part to the work of faculty member Joe Medeiros and the Environmentally Concerned Organization of Students Club, for many years has celebrated Earth Day on a scale that is not seen at many other community colleges. In this edition we take a look at the history of the creation of National Earth Day, born of an environmental movement that took shape due to the inspiration of individuals like John Muir and the publication of works such as “Silent Spring” by Rachael Carson. We also take a look at the life of the founder of Earth Day Gaylord Nelson. This edition also takes a look at the works of a local icon of conservation, the aforementioned Joe Medeiros. Joe has spent the past 18 years teaching at Sierra College, inspiring the minds and hearts of all who took his classes. Joe has also worked hard to protect the natural areas of Placer County and beyond and to make his students aware of their role in protecting our environment. Joe made the decision to end his career in teaching this past semester and to start the next page of his life. We are lucky enough to have a contribution from Joe Medeiros in this edition reflecting upon his own love of the trees of the Sierra. Since he is as much an artist as he is a scholar we have also placed within this edition some examples of Joe’s magnificent artistic works. Though we have learned much about the environment and changed many of the ways in which we interact with it, we still face very real ecological problems. With an eye to the future we also include a recording of a recent visit to Sierra College by Dr. Jeff Price, Nobel Laureate, of California State University, Chico and the UN International Panel on Climate Change, for a discussion on global warming entitled “The Real Day After Tomorrow”. It is important, as we look to our east and see that great and snowy range, that we do not forget the lessons of the past and work to find useable solutions for the future. This is a situation where standing on the shoulders of giants, such as those belonging to Muir, can only help us to find a better, more sustainable future. As always, we hope that you will find this edition educational and interesting. Suggestions and submissions are welcome at kcarroll@sierracollege.edu. We again would like to point out that this edition would not have been possible without the hard work of Mike Price, who formats each edition and posts it to the web and Gary Noy, the head of Sierra College Press, who continues to guide us through this process.